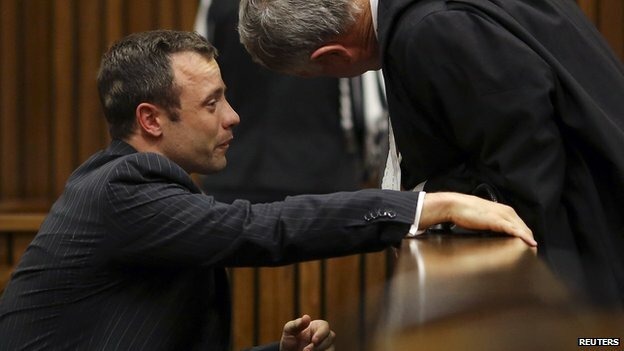 Oscar Pistorius vomited in court as he heard a pathologist’s testimony about the nature of his girlfriend’s injuries after he shot her dead. Earlier the judge banned all live broadcast of the autopsy evidence. Pathologist Gert Saayman successfully argued that broadcasting the details of the report could compromise the “dignity of the deceased“. The Paralympic athlete, on trial for murder, denies intentionally killing his girlfriend Reeva Steenkamp. Mr Pistorius’ body jerked and he retched as he heard the pathologist’s evidence, reports the BBC’s Pumza Fihlani at the court in Pretoria. A bucket was placed next to Mr Pistorius, who broke into tears on several occasions, leading the judge to briefly halt proceedings. The BBC is not able to report the details of the autopsy because of reporting restrictions, but correspondents described it as “graphic”. Ms Steenkamp was shot four times through a bathroom door. 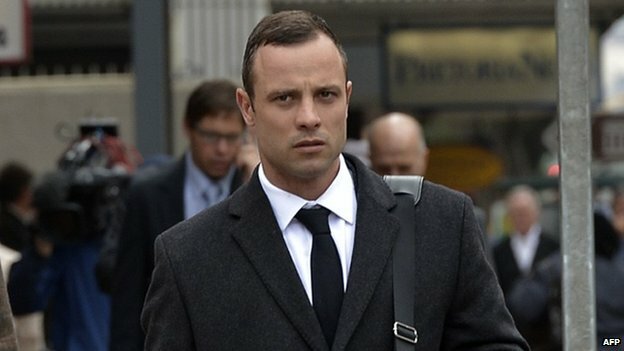 Mr Pistorius says he mistook the 29-year-old model and aspiring lawyer for an intruder. The judge also banned coverage of the details of the autopsy report through Twitter and other social media. Large parts of the trial have been televised – a first for South Africa – but there are some media restrictions in place. For example, there is a ban on showing the faces of witnesses giving evidence, as well as on close-up shots of people in the courtroom. Earlier, a security guard at the compound where Mr Pistorius lived defended his own account of phone calls made in the minutes after the shooting of Ms Steenkamp. If found guilty, the 27-year-old, a national sporting hero dubbed the “blade runner”, could face life imprisonment. On Friday Mr Baba, a security guard working at Mr Pistorius’ gated community, spoke of his shock at seeing Mr Pistorius carrying a dying Ms Steenkamp down the stairs at the athlete’s villa. Mr Baba said he had called Mr Pistorius in response to neighbours’ reports of gunfire from the house in the early hours of the morning. The guard said Mr Pistorius had told him: “Everything is fine,” before calling him back a few minutes later and crying down the phone. On Monday, Mr Pistorius’ defence lawyer suggested the athlete had called Mr Baba first and not the other way round, but the witness stuck to his testimony. Mr Pistorius’ lawyer, Barry Roux, then suggested his client had said: “I am fine,” and not: “Everything is fine,” but again the witness said this was not true. “My Lady, what I just told the court is the truth,” Mr Baba told the judge. During an emotional testimony on Friday, his former girlfriend, Samantha Taylor, described how Mr Pistorius fired his gun from his car. The athlete denies doing so. Mr Pistorius has appeared distraught as the events of 14 February 2013 have been recounted in the court in Pretoria. 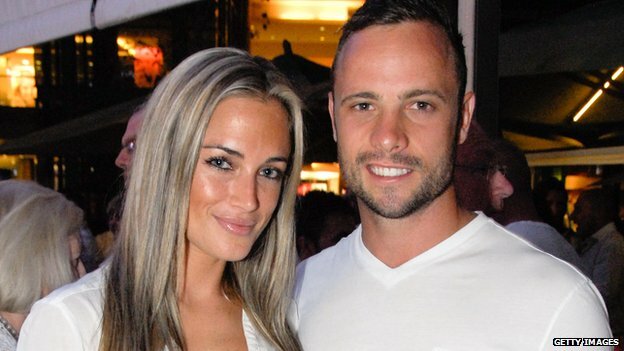 The state is seeking to convince the court that Mr Pistorius and Ms Steenkamp, a model, reality TV star and law graduate, had an argument before the athlete fired the shots that killed his girlfriend. There are no juries at trials in South Africa, and his fate will ultimately be decided by the judge, assisted by two assessors. Posted on 10th March 2014 by newsafrica. This entry was posted in Africa, Human Rights Violations, Oscar Pistorius Murder Trial, Women's Rights and tagged Baba, BBC, Oscar Pistorius, Pistorius, Pretoria, Security guard, South Africa, Steenkamp. Bookmark the permalink.